The Border Terrier Temperament: Meet The Tough, Notorious Escape Artist! Before you add a Border terrier to your family, it is important to be aware of the major concerns associated with the Border Terrier temperament, personality, and characteristics. This will assist you in weighing both the advantages and disadvantages of owning such a dog, and make the best decision for you and your family. The first thing you should know is that they are loving and playful dogs. This coupled with the obedient Border Terrier temperament make them super easy to get along with. Border Terriers also make good human companions. The independent side of the Border Terrier temperament is a positive trait that most owners like. This is because this is a breed that can learn new things very quickly. Because of the Border Terrier’s toughness and inherent curiosity, he will explore on his own and without fear in an effort to learn new things. They also can easily adapt to different situations and environments quite easily. However, if you’re not careful, his admirable independence can morph into stubbornness. 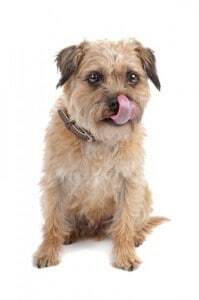 If you notice this happening with your Border Terrier, you should be consistent and firm with the commands you give him. This tells him that you rule the roost around here, not him and that you mean what you say and you refuse to let him push you around. Another Border Terrier personality trait to be aware of is his potential desire to escape. Border Terriers are naturally clever escape artists. To deal with this problem, experts recommend keeping your dog in a fenced-in yard. This will allow him roaming space while ensuring that he remains safe. However, just because you have a fence doesn’t mean you shouldn’t still keep an eye on your pooch. If you do not have enough space in your yard for a fence, then the Border Terrier is not the right dog for you. A defining trait of the Border Terrier is his desire to make noise. Yes, he is one of those dogs who bark at everything that draws his attention. You must deal with this bad habit before it becomes a real problem. You must train your dog to only bark when he has good reason to bark. Otherwise, it will be a “boy who cried wolf” situation, and when there’s a true threat, you won’t believe him. Not only that, but a yappy dog annoys not only you but everyone who lives in close proximity to you. Be a good neighbor and teach him to shut his trap unless it’s important. If you are away from home all day, then the Border Terrier is not the right dog for you. This is because he is more likely to fill his days with barking if left unsupervised for long periods of time. One temperament trait that no one wants to have to deal with but that can come up with the Border Terrier is aggression. Before even dealing with an aggressive Border Terrier temperament, it is important to first learn what’s causing it. If another dog attacks or scares your dog, he is likely to also become aggressive in retaliation for the sake of his own defense. Despite being on the smaller side, Border Terriers are tough and won't always look the other way if threatened. The fearless Border Terrier temperament means he gets along well with other pets you have raised him with. He does not, however, get along with small animals he might consider prey. This includes animals like cats, rabbits, birds, guinea pigs, squirrels, mice, and rats. The Border terrier almost always feels compelled to run after and harass anything that moves quickly. Breeders in the U.K. and Scotland bred Border Terriers for the purpose of bolting, or finding, foxes who hid in man-made structures. Border Terriers also hunted rodents (known as “ratting”), otters and badgers. Over the years, Border Terriers have appeared in a number of television shows and movies. Some of the more famous Border Terriers to appear in television shows include Lucky from Felicity and Toots of Lassie fame. In addition to the tips mentioned above with regard to training, you MUST socialize your Border Terrier as early and as often as possible. This will ensure he is well-adjusted as an adult. Don’t be too harsh when training your Border Terrier or you can break his spirit. Understand that his independent nature means he is naturally inclined to think for himself. This means that he can easily lose focus during training, but you just need to have patience with him to get him back on track. Also, understand that he can’t resist the thrill of the chase. So if you’re training him outside, and he catches sight of a squirrel, gone are your chances of holding his attention for that training session. If you are up for the fun and challenge of training your Border Terrier then check out these The Online Dog Trainer. The Border Terrier has a double coat, and he sheds seasonally. Typically, a quick brushing once or twice a week is all you need to keep his coat under control. During shedding season, though, expect to spend a half-hour every day stripping his coat, either by hand or with a tool designed for the purpose. You don’t really need to bathe the Border Terrier, and you actually shouldn’t. This is because bathing him robs his coat of the ability to repel dirt on its own. To clean him up, just use a brush and a dry towel, and his coat will naturally do the rest. There are many haircuts you can give your Border Terrier, though DO NOT attempt to do this yourself. If you cut his coat wrong, it can grow in wrong…permanently. For haircuts, visit the groomer. If you’re looking for a hypoallergenic dog, you’re never going to find one. The only way to know for sure if you’re allergic to a particular dog is to spend some time with one. And, as with any other breed, you need to brush the Border Terrier’s teeth and clip his nails regularly. Border Terriers are pretty active and, as such, need regular daily exercise. It doesn’t have to be anything too crazy – a half-hour of walking or playing each day should do the trick. Always walk him on a leash due to his tendency to chase after potential prey. And always watch him in the yard to make sure he doesn’t dig under the fence. However, don’t worry right away if you notice your Border Terrier shaking – he may just be really happy to see you! Nonetheless, have his condition evaluated by a doctor before you rule out CECS. On average, the Border Terrier’s size is between 11 and 16 inches tall, and between 11 and 16 lbs. The Border Terrier ‘s life expectancy is between 12 and 15 years. Considering adding a Border Terrier puppy to your family? You may not be sure of where to start. You can find a Border Terrier for sale either through a breeder or from your local animal shelter. For a Border Terrier puppy, you can expect to pay anywhere from $800 to $1,500, depending on the breeder. A dog who costs this much should come with all of the necessary paperwork and health clearances. Your local animal shelter may have a Border Terrier puppy up for adoption. However, if they don’t have one when you first look, check back again later. Shelter “stock” is always changing, so you just never know. Adoption is a great idea if you are interested in a Border Terrier mix. This is because you can only usually get a purebred from a breeder, and purebreds are expensive! Another upside to rescuing a dog from a shelter is that the shelter strives to ensure rehoming by training their dogs. If you could adopt a dog that is already house-trained and no longer a chewer, wouldn’t you? That is the goal of most, if not all, shelters. If you’re in the market for a reputable breeder, check out the website for the Border Terrier Club of America. You can usually trust that the official page for a breed will only put their name behind breeders whom they can support as above-board. Conclusion: Why the Border Terrier? The intelligent Border Terrier temperament can make him both a joy and a pain to own. While he may be easy to train because he’s so smart, he can also be difficult to train because of his ability to go off and do his own thing. It all depends on the day. He has a natural inclination to bark, as he likes to hear himself. So, make sure you help him keep that in check or it can get really annoying really fast. He’s a rather active pup, so make sure you exercise him daily. Don’t let him off the leash, as he can take off after potential “prey,” and make sure he’s not spending all his time digging under the fence. The Border Terrier belongs to a dog group known as the Terrier Group. Dogs in this group come in various sizes and they are spunky and high-spirited. Previous post: Australian Shepherd Temperament: Are you Ready for a Canine Genius?